This week, for the Picture a Day Project, I've decided to add a theme. The theme? Corners. I didn't come to it by any great process. It was simply that this morning I realized that of the four pictures I took, half of them were of the corner of a room. Then, while working on this post, I enjoyed thinking of the comforting idea of in someone's corner. Lately, I have been enjoying the support of friends who have been giving support and encouragement, who have been in my corner. There's also the backed into a corner idiom... not so pleasant, but it happens. If anyone wants to share their pictures, literally or figuratively, please show us your corners. And if you feel backed into a corner, maybe we can show you there's someone in your corner, ready to give encouragement. This corner is so full of things and feelings I love, with stories to tell, I don't know where to begin! A list? Top to bottom? Left to right? Metaphorically? Anecdotally? On the wall, framed, is a family recipe for oatmeal cookies. The oatmeal cookies. The ones I remember since I was a girl, that my mother made when I was five and we lived in Ramona, where there was a field of sheep across the street, and I'd follow my cousins to the creek to catch tadpoles, frogs, fish, and beetles. In Ramona, two blocks from Main Street, my mother's shop, the kindergarten on the other side of Main Street, my father's red truck in the dirt driveway. The same cookie recipe I followed when I won a blue ribbon in the sixth grade baking contest, that I would happily bake on demand for my brother Bill. It's perfectly worn, stained and tattered, a treasure. Rowe Pottery, and Rockdale Union Stoneware, from twenty-nine years of visiting Wisconsin. I still remember my first visit, when Geoff proposed, and I met his family, when I fell even more in love with him, and with thoughts of building our lives together. The salt-glazed stoneware is beautiful, and practical, and I remember thinking, Someday I hope we have a nice collection, that there will be old and familiar pieces in our kitchen, that have served us, and made me happy with their pretty motifs, and forms. It was more about associating them with making traditions, memories, connections, than simply having a lot of pretty dishes. And now, all these years later, I enjoy the gratitude, the pleasure that I am reminded of because we have visited Wisconsin, because we have baked pies, and made dinners, and washed dishes, and fed families, and been together, happily. It's lovely to turn toward this corner and be so sweetly reminded of dreams that have come true. 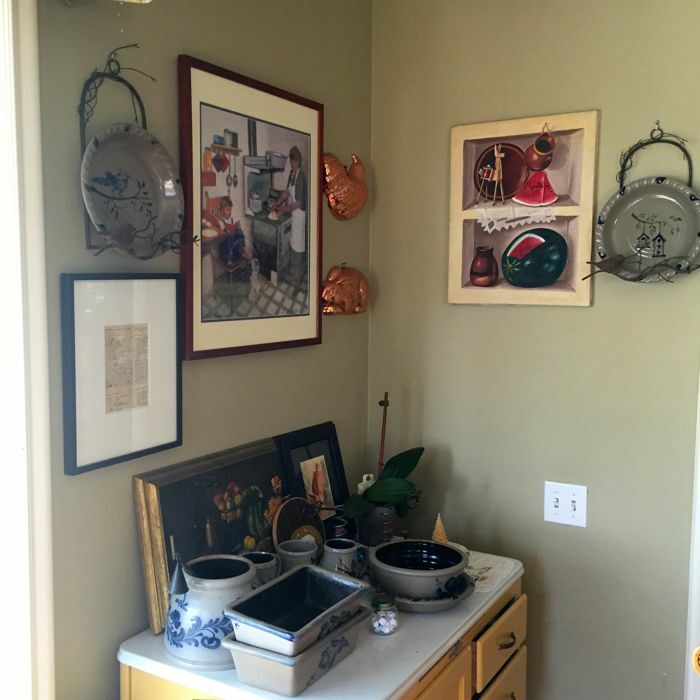 And while we visited Laura and Gary on our recent visit to Wisconsin, I saw how they displayed their pie pans, and admired it. I told Laura, how Alex and I had just been discussing that our own pie pans sat stacked on a shelf, where we couldn't appreciate the paintings on them. They are always either covered in good food, or put away. Back home, simply by fortune and chance, William brought out two plate displays, with birds (no surprise,) that had been long ago stashed away, out of sight! Now, like Laura and Gary, we can enjoy our pie pans, even when there is no pie! The print of the boy reading in the kitchen has always felt like a familiar reminder of our family, of madres en cocinas of tortillas, of books, homeschooling, comforts and traditions across generations. It's a print my mother brought me from her travels. On top of the Hoosier cabinet is a painting done by my great-tía Thalia, and she painted the watermelon, too. She was my grandmother Eunice's sister-in-law, and she began painting much later in life. Her work brings back happy memories, spiced with scents, sights, and sounds of the painted walls of her old home in Mexico City, the African violets, her dolls, the philodendron that I recall as growing from the first floor, vining around the room, reaching the second floor by way of the stairwell. I think of open stall markets, ancient ruins, and late nights with cups of coffee, pan dulce. Alex's painting, a watercolor rabbit is there, too, and Maria's jar of lucky stars. Organically, naturally, a narrative is spoken here... something to do with art, with traditions, with generations connected by making, cooking, painting, creating. In my corner I have family, resources, memories, a history, and hopes for the future. No wonder I like seeing this space in our home.